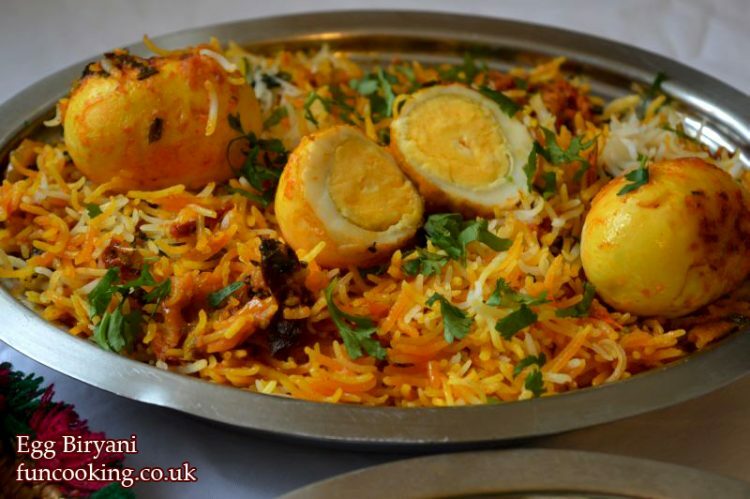 Egg biryani recipe – The most easiest, delicious and flavorful biryani that one can make at home with very few ingredients. 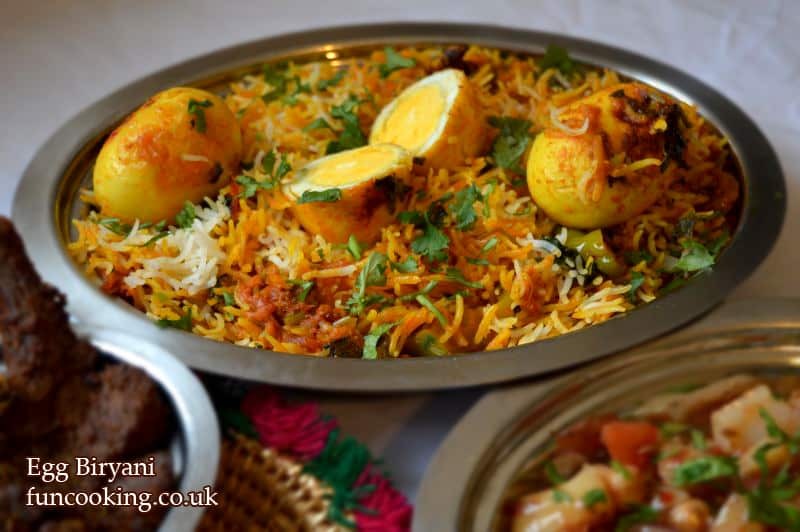 … Let us Learn to make easy egg biryani recipe with step by step photos – fragrant rice cooked in aromatic biryani spices and boiled eggs. 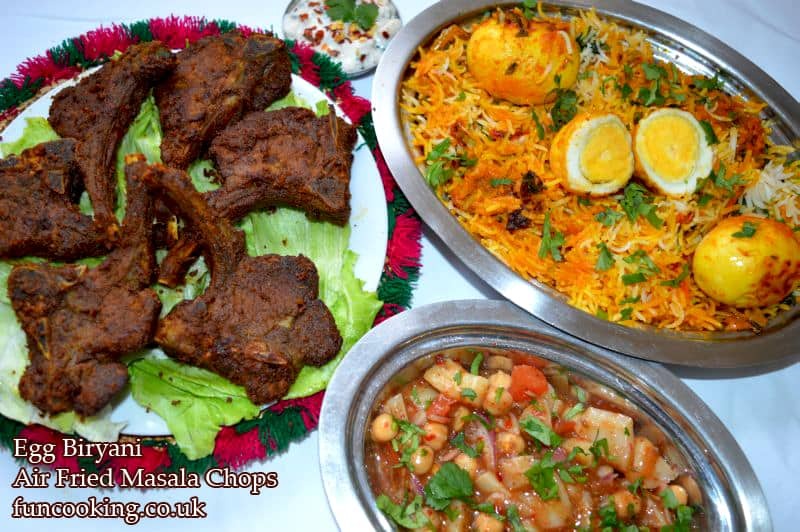 Best to prepare when running short of time and desiring to have a special meal. Any raita (yogurt dip) will go well with this. 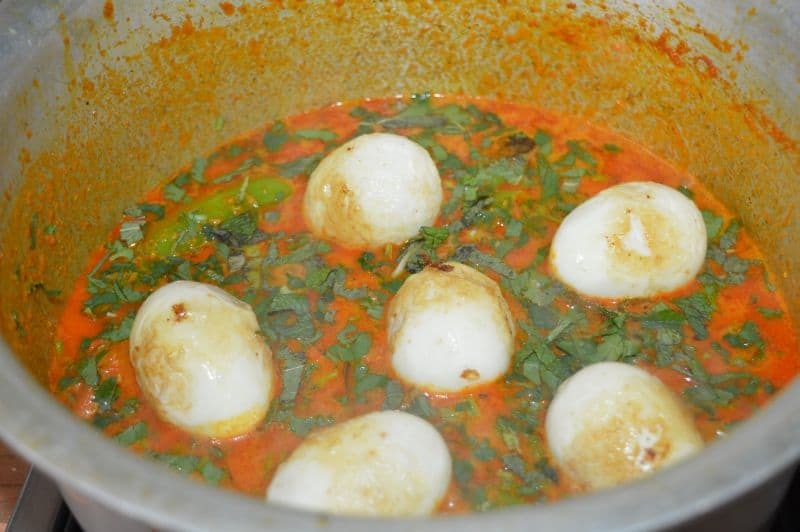 Hard boil eggs. Peel , set a side. 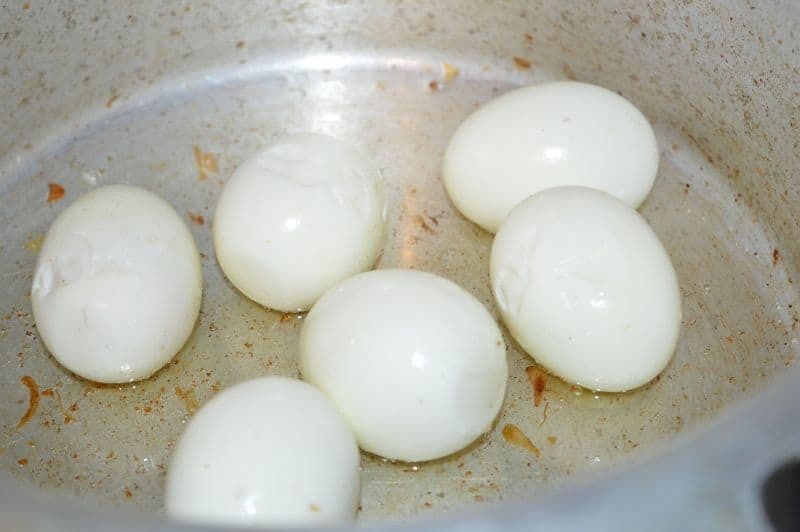 Take a pan, add 1/2 cup oil, fry these eggs until light brown. Take out set a side. 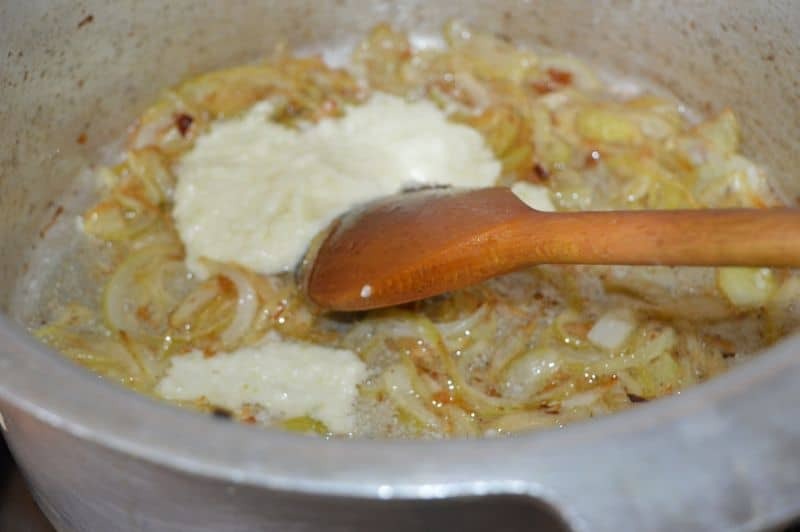 Now same oil , add 1 finely sliced onion. Cook until light brown. Add 2 tbsp ginger garlic paste, Stir few seconds. 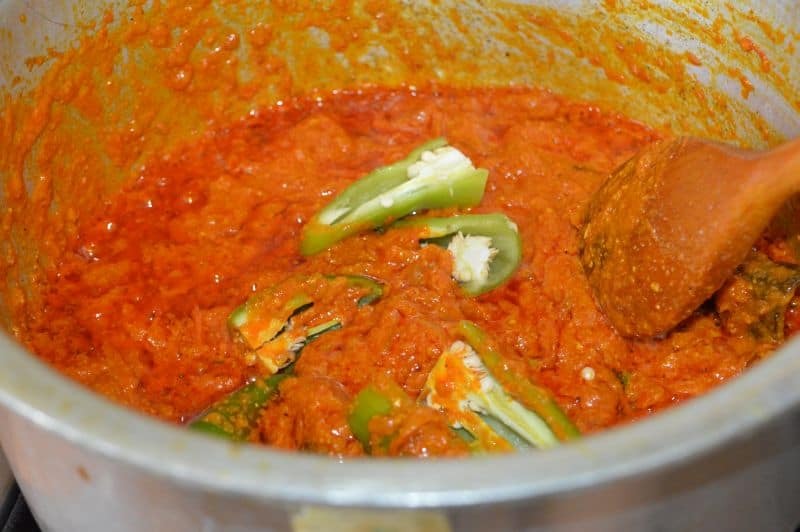 Now add kashmiri red chili powder, turmeric powder and list 2 ingredient. Stir few seconds. Add sliced tomatoes and yogurt. 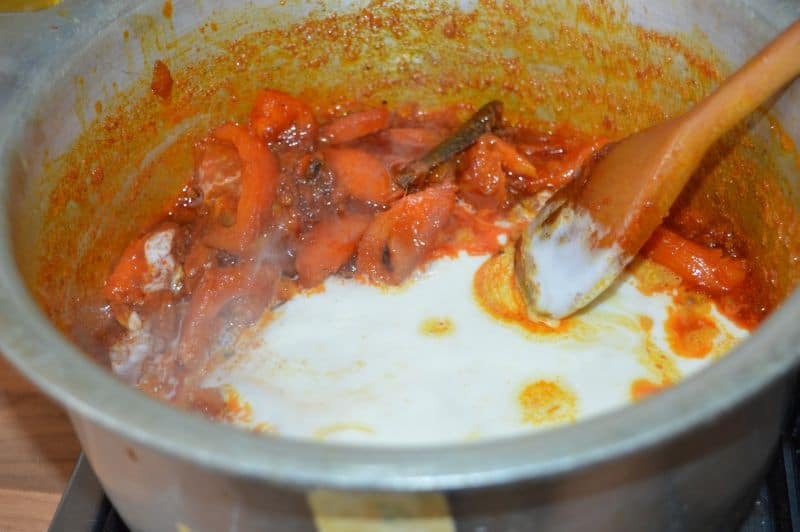 Cook until you see oil with sides of pan and tomatoes vanish in it. Now add green chilies cut in half. Add 1/2 cup water in it. Mix well. Keep eggs on it. Spread half chopped coriander and mint on it. Turn off the heat, set aside. Fill a pan with water. Add 2-3 tsp salt. Bring it to boil. 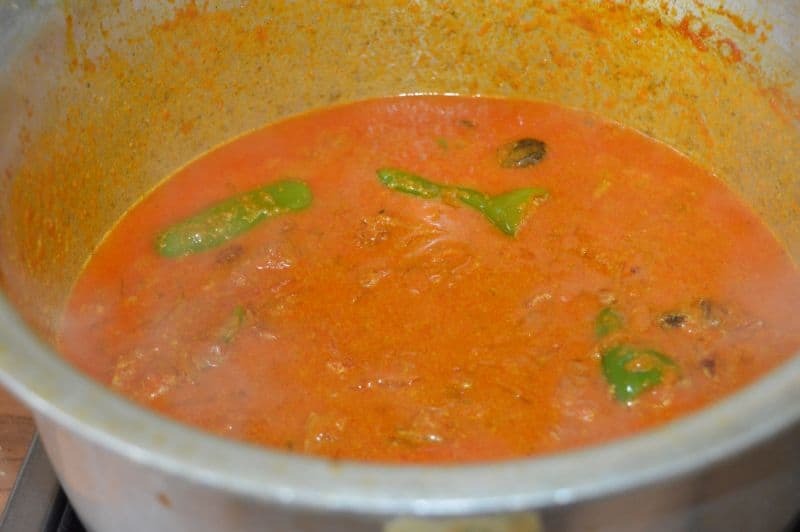 When you see first boil, take out half rice with a spoon and spread on egg masala. Now let other rice boil for 1-2 minute. Take out and layer on previous rice. Spread remaining chopped coriander. yellow colour on it. Sprinkle Kewra Water on rice. Close the lid. Turn the heat high until you see steam coming our of the pan. Now on very low heat ,cook it for 10 minutes. 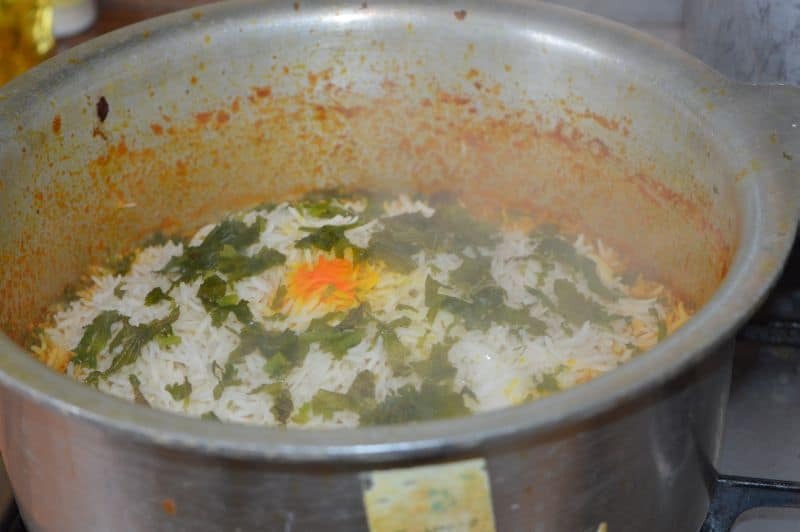 Egg biryani is ready to serve. 1. 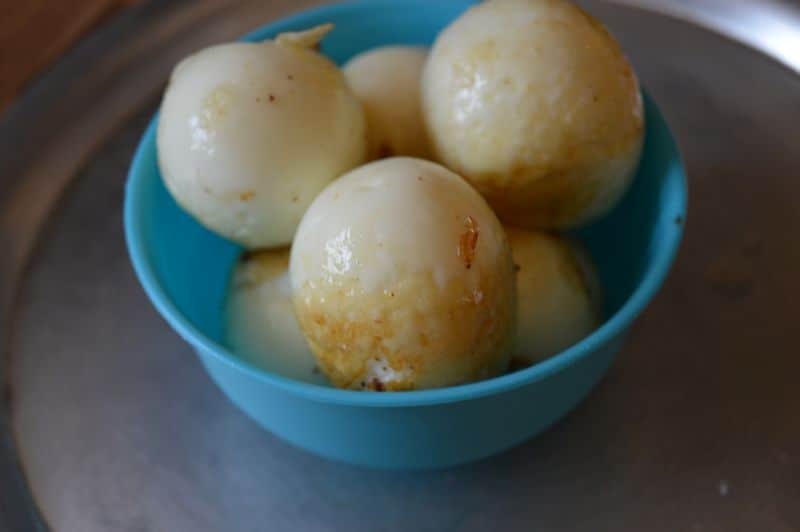 Hard boil eggs for 15-20 minutes. Peel them. Now in a pan add 1/2 cup oil. 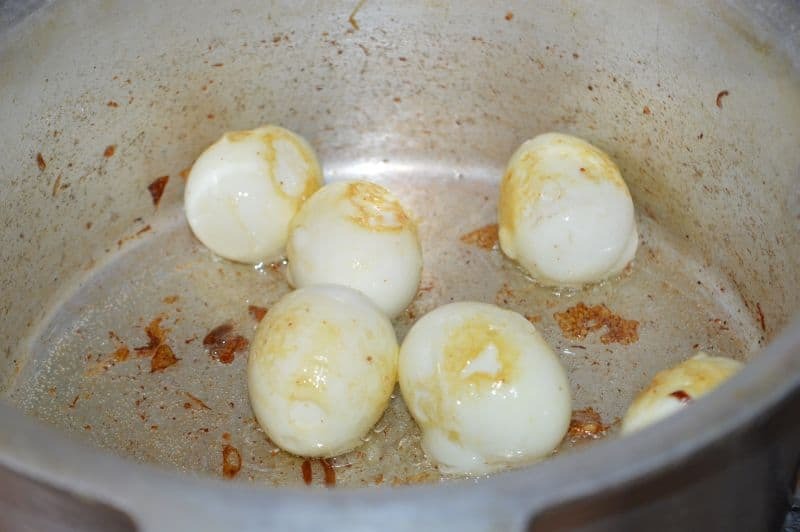 Fry these eggs until light brownish in colour. 3. Take out set a side. 4. 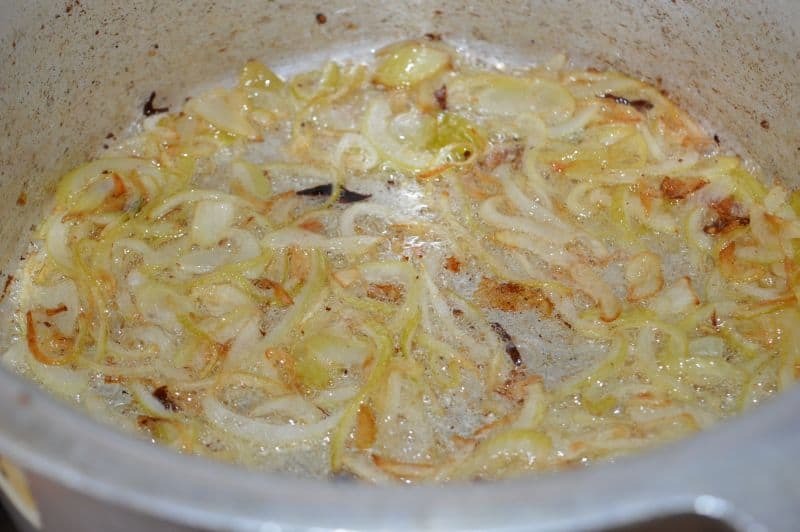 Now same oil, add 1 finely sliced onion and cook until light brown. 5. Add ginger garlic paste. Stir few seconds. 6. 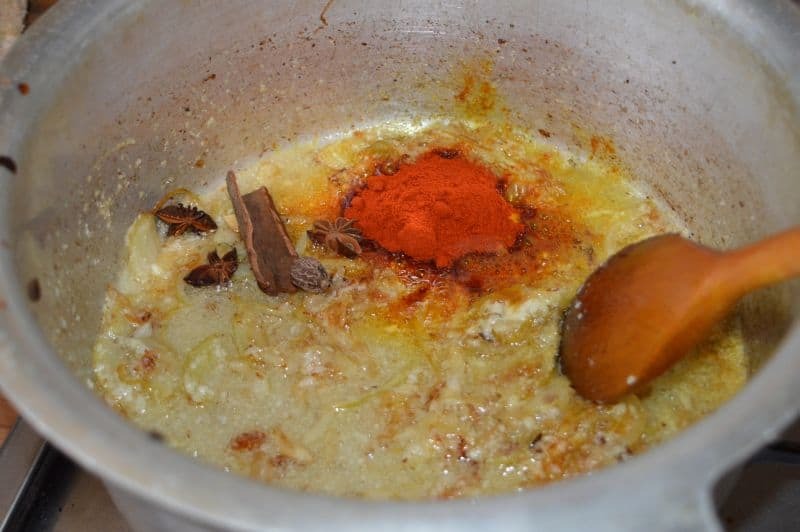 Add in kashmiri red chili powder, turmeric powder and list 2 spices. Stir fer more seconds. Do not burn it. 7. Add 2 sliced tomatoes. 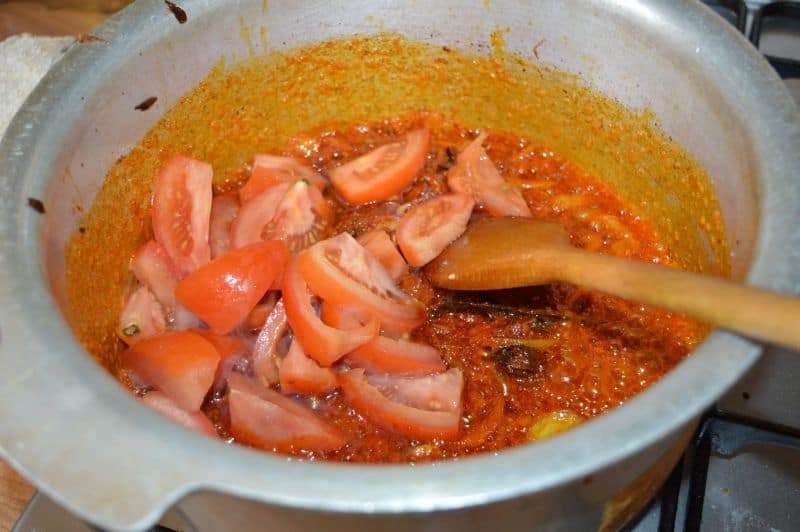 9.Cook it until you see oil with sides of the pan and tomatoes vanish in curry. Add green chilies and salt as required. 10, Add in 1/2 cup water. Mix well. Turn off the heat. Now keep fried eggs on it. Spread half chopped coriander and mint on it. 12. 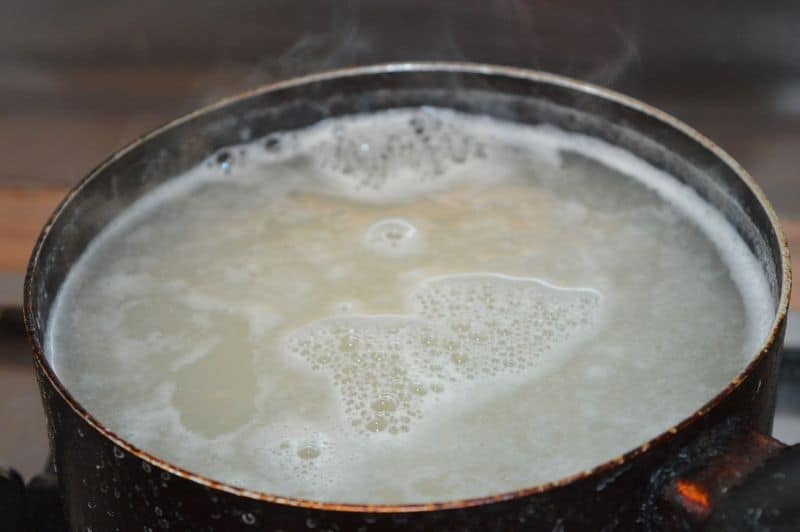 Boil water in a pan.Add salt 3-4 tsp. 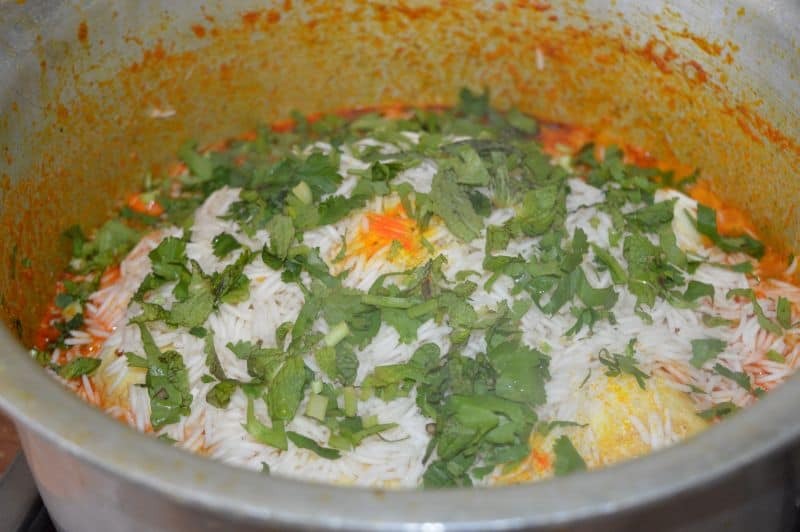 Add soaked rice (which you soak for almost half hour). Let it boil again. 13. Take out half rice with big spoon. 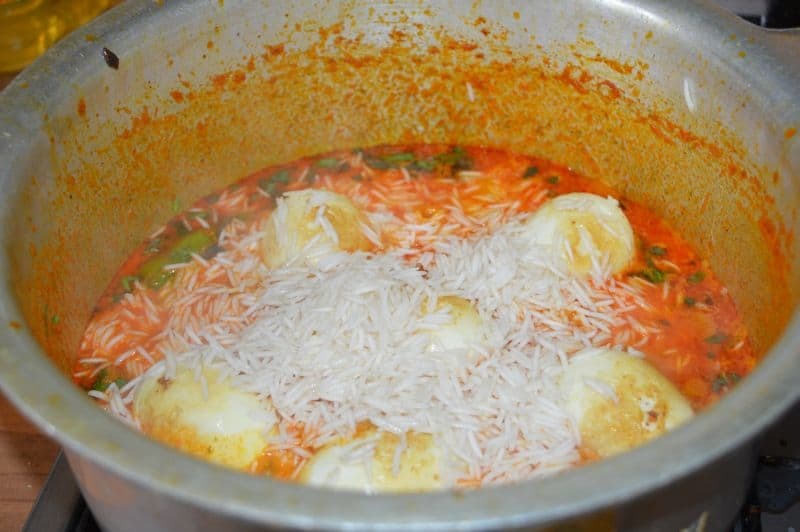 Spread on egg curry. 14. Now let remaining rice boil for 1-2 more minutes. Take out and spread on previous rice. Sprinkle remaining coriander, yellow food colour and kewra water. 13. 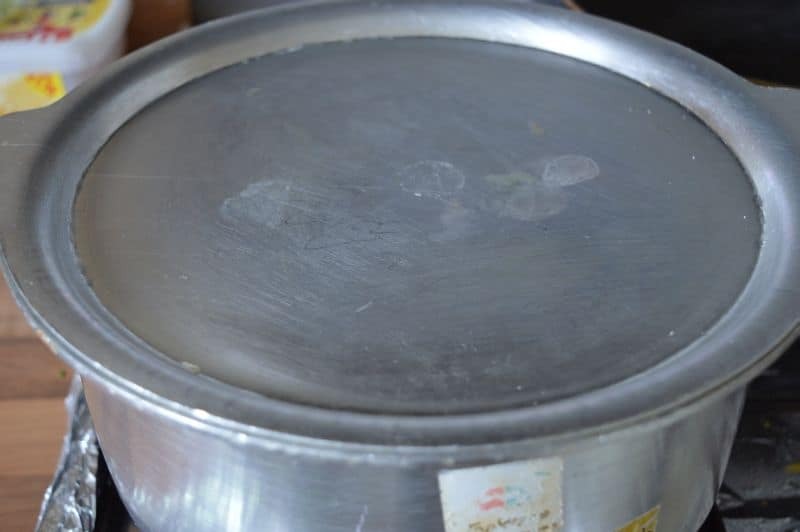 Cover it with lid and turn on the heat high until you see steam coming out of the pan, then turn the heat slow and cook it for 10 minutes. 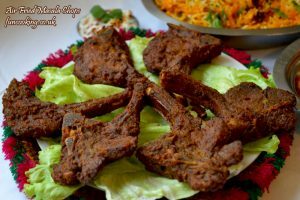 I served this biryani with Air Fried Masala Chops. Recipe given below.